Deregulation and privatization of the energy market are causing energy suppliers in the public and private sectors to monitor the status of their electrical network. At different scales, both sectors face similar issues for proper energy use. Chauvin Arnoux Energy, a company in the Chauvin Arnoux Group, proposes its technological expertise with a range of products and systems which are accurate, reliable and long-lasting. For maintenance and operation of the electrical network, the power monitor indicates the values of a wide range of network parameters, advantageously replacing a whole set of panel meters, transducers and switches. 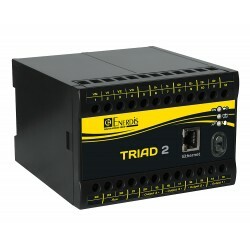 The gains for operators are not just financial (as soon as there is a power and/or energy management, the power monitor becomes more interesting in economic terms and considerably simplifies installation and wiring, as well as saving space on the switchboard or in the cabinet), but also technical because the power monitor will provide additional functions such as storage of the extreme values reached by the fundamental network parameters. With its numerous output possibilities, the power monitor becomes an energy meter (pulse output), a transducer (4...20 mA analogue outputs) or a digital sensor by means of a series link, so that you can access and process the data remotely. Lastly, thanks to its alarm outputs, supervision and maintenance of the electrical network are simplified by monitoring various parameters with regard to the thresholds programmed by the operator. Intelligence: when associated with the internal clock, the power monitor's processor and memory enable it to offer recording functions. For operators, this means that the load curves of their network, the trends of the main parameters and the possibility of time/date-stamping events (alarms, outages, etc.) are available. To meet changing consumer demand, today's power monitors supervise the quality of the electricity supply: detection of voltage faults, calculation of the current in the neutral conductor, total harmonic distortion, etc. Monitoring of the electrical network to limit operating losses by detailed mapping of the network and quickly identify any symptoms linked to energy quality.